For courses in English Composition. 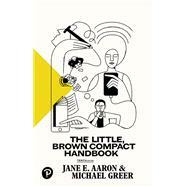 The Little, Brown Compact Handbook maintains the authority of its best¿selling parent (The Little, Brown Handbook) in a briefer book with spiral binding, tabbed dividers, and plentiful exercise sets. It is an essential reference tool, designed to help readers find the answers they need quickly and easily. While keeping pace with rapid changes in writing and its teaching, this meticulous compact handbook combines comprehensive research and documentation ¿¿with grammar coverage that is second to none. Incorporating detailed discussions of critical reading, media literacy, academic writing, argument, and much more, The Little, Brown Compact Handbook is an accurate, reliable, and accessible resource for writers of varying experience levels and in a variety of fields. The 10th Edition includes timely new student samples, new learning objectives, updates to MLA and Chicago style, a new chapter on writing about literature, and more. The Little, Brown Compact Handbook is also available via Revel™, an interactive learning environment that enables students to read, practice, and study in one continuous experience. Jane E. Aaron has taught writing at New York University and several other schools. She is the author of eight successful and long-lived composition textbooks, including The Little, Brown Handbook and The Little, Brown Compact Handbook. Michael Greer teaches writing, editing, and publishing in the Department of Rhetoric and Writing at the University of Arkansas at Little Rock. He also teaches courses in multimedia, online course design, and assessment for the Graduate Certificate in Online Writing Instruction at UA, Little Rock. Michael edits the journal Research in Online Literacy Education and is a founding member of the Global Society of Online Literacy Educators. He publishes and presents on topics including user-centered design, interactive media, and digital publishing. Michael serves as a faculty advisor and author for Gadget Software, where he is helping to design and develop a mobile learning platform. He lives in Boulder, Colorado.